MAYOR PICKS NAME OF HOUSE WINNER: Mayor William E. Brown jr., smiling broadly, draws the first name out of the hat in the "lottery" for the house on Mt. Pleasant Ave. First name drawn was that of Marinus M. Hinckley of 210 W. Washington St. who thus had first choice at buying the $13,000 five-room home built by high school students. Holding the hat is John H. Stueckemann, who supervised the project. 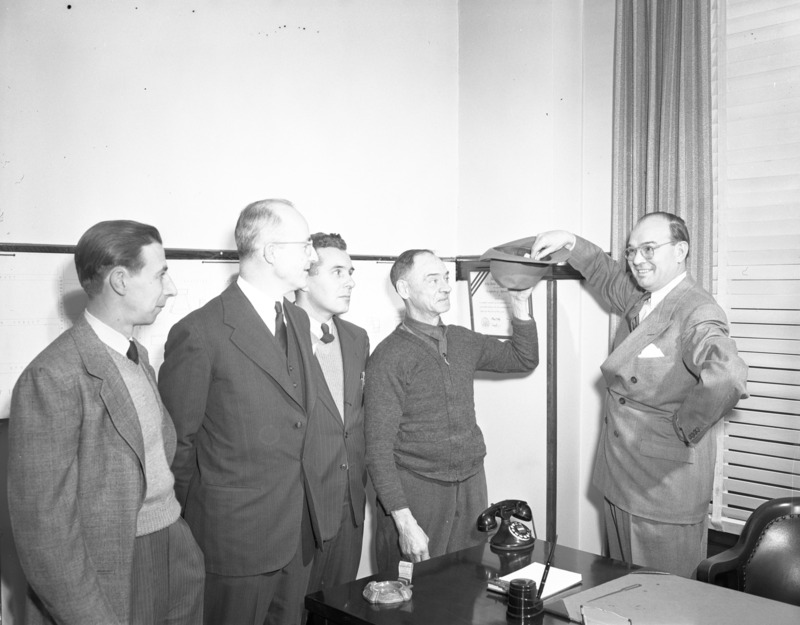 Left to right, others in the picture are Walter Anicka, architect of the house; William C. Walz, president of the Ann Arbor Federal Savings & Loan Association; and R. A. Silverstone, high school vocational co-ordinator.